Lofts In The 'Lou: Choteau Greenway - Events Tomorrow and Saturday!!! Choteau Greenway - Events Tomorrow and Saturday!!! The first time I heard about re-building Choteau's Pond was during the real estate boom in 2005. My expectations were low. Being a St. Louisan born well after 1850, I hadn't heard of its predecessor and its tragic demise. I had heard of many grandiose plans for development that didn't take off, and this sounded too good to be true. The fact that the area had been converted into a somewhat obsolete, underutilized rail yard as well as Cupples Station area, Union Station and the Sheraton City Center Hotel (Edison Condominiums) --the whole pond couldn't be restored, but anything designed to beautify the city and energize its residents was attractive. Many people I spoke to loved the idea of reworking an attractive recreational area into what seemed to be a blighted scar on the downtown landscape. Beyond that, the dream of having a network of bike paths crisscrossing the St. Louis area would be an attraction that would be transformative. 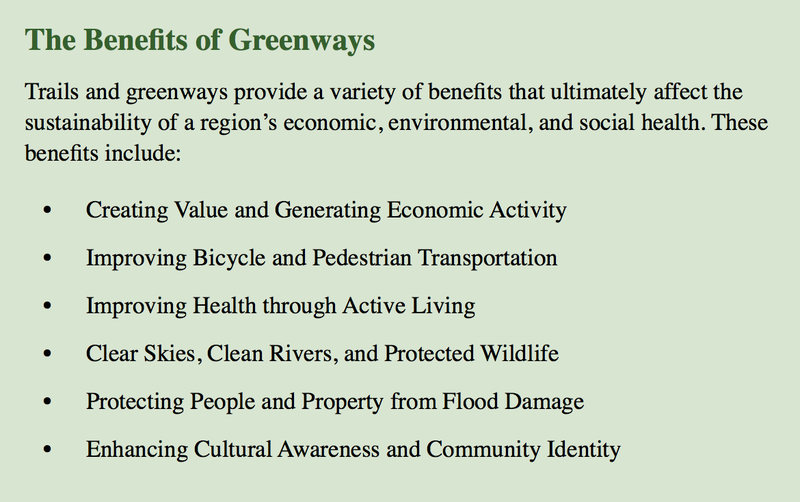 Fast forward to 2016 - despite my skepticism, I've stayed interested and read up on any progress on the subject on GreatRiversGreenway.org . Studies by the National Association of Realtors showed ‘trail availability’ outranked 16 other options including golf courses, security, sports fields, parks, and access to shopping or business centers. They help build and sustain economic activity as well as increase property values of nearby homes as well as other . 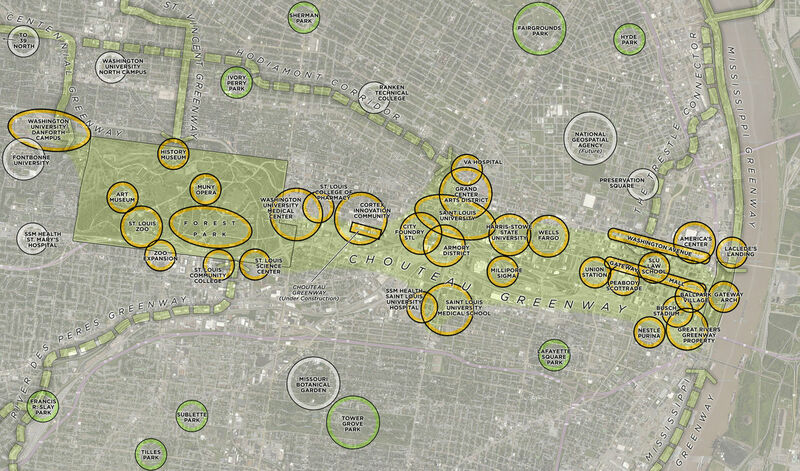 The ultimate goal of the Choteau Greenway seems to be connecting Forest Park to Wash U Medical School, Cortex and Downtown, but that would be eclipsed by the master plan of making more connections on the Centennial Greenway Trail to extend from Forest Park to the Delmar Loop to Creve Coeur Park then on to St. Charles. 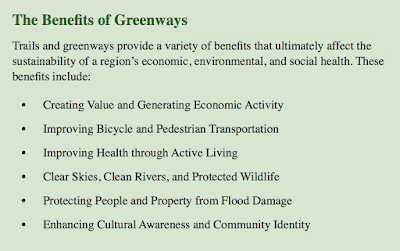 Currently there is a survey on the Gateway Rivers Greenway site to solicit public input about various aspects of trail development and an international design competition in the works. The four remaining teams are set to have two public meetings in January and public participation is crucial. The more people that are 'in the know,' the better. Downtown residents are especially encouraged to show up for Meet the Designers Night or Community Day. When I talk to loft owners ready to sell, anything benefiting property values is always welcome news. 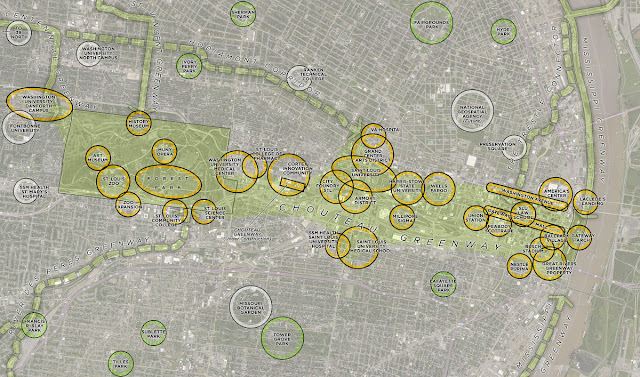 Overall, the excitement for this type of project in St. Louis is building. Cities have been realizing that catering to the health and recreational needs of its residents is imperative if they want to continue to attract businesses and new residents. Predictions about the 2018 Housing market nationwide predict that the single greatest demographic will be millenials looking for starter homes for the next several years, and citing their attraction to urban core areas with attractive, walkable areas. These nationwide trends will appear to benefit areas like St. Louis due to a more affordable area, lower taxes and available urban housing.